US surgeons operating on a brain tumour in a baby boy found a tiny foot inside his head. The growth may have been a case of "foetus in foetu" in which a twin begins to form within its sibling. 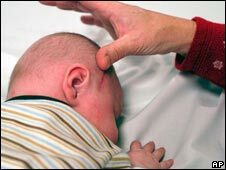 However, the team at Memorial Hospital for Children in Colorado Springs said such cases very rarely occur in the brain. It may also have been a type of congenital brain tumour. But such growths are usually less complex than a foot or hand, the doctors added. Dr Paul Grabb, a paediatric neurosurgeon, said Sam was otherwise healthy when he underwent the procedure in October. "It looked like the breech delivery of a baby, coming out of the brain," he said. "To find a perfectly formed structure (like this) is extremely unique, unusual, borderline unheard of." Sam's parents, Tiffnie and Manuel Esquibel, say their son is at home now but faces monthly blood tests to check for signs of cancer or regrowth, along with physical therapy to improve the use of his neck. But they say he has mostly recovered from the operation. "You'd never know if he didn't have a scar there," his mother said. Mr Dominic Thompson, a consultant paediatric neurosurgeon at London's Great Ormond Street Hospital, said there were probably fewer than 100 recorded cases of foetus in foetu in the medical literature. He said another possibility was that the tumour was of a type called a teratoma, which can include tissue such as muscle and fat, and more rarely bone and teeth. However, he said the available details from the US case suggested that foetus in foetu was the most likely explanation, as the tissue was so exceptionally well formed. Trevor Lawson, of the charity Brain Tumour UK, said: "Even with modern imaging techniques, surgeons can't be entirely sure of what they'll find when they go into the skull. "Even so, this is an exceptionally rare event. "It's good to know that baby Sam is recovering well. Brain tumours now kill more children than any other solid cancer and it's essential that more research is undertaken to identify what causes them. "Where appropriate consent is gained, rare events like these can sometimes provide invaluable genetic material that gives an insight into the origins of these traumatic tumours."